To support our aim of promoting education in the areas of petrophysics and formation evaluation, AFES offers bursaries to MSc students and partial PhD funding. AFES is a registered charity in Scotland (SC039526) therefore funding is only available to Scottish-based institutions and students studying at Scottish Universities. MSc bursary requests are accepted between early April and late September. PhD funding applications are open from September to December. Academic institutions funding requests are accepted and considered throughout the year. AFES currently offers two types of student bursaries to MSc students: an exam-based prize and a project-based prize. The exam-based prize is currently on offer to students studying the Integrated Petroleum Geoscience MSc at Aberdeen University. It is awarded to the student with the highest marks in the Petrophysics exam. This will be awarded as soon as the results of the exam are confirmed by the University, and the prize is currently offered at £250. The project-based prize is offered to students at UK universities. To be eligible, you must have a significant petrophysics component in your Masters project. Successful candidates will demonstrate that their project has a practical application of petrophysics and show an interest in the broader discipline of petrophysics. Preference will be given to a non-sponsored student on an MSc course, but the final decision is at the discretion of the AFES committee. The successful students will be expected to produce a poster of their Masters project or brief presentation at an AFES evening event. The amount currently available is up to £500 per student. AFES will review your application and let you know as soon as possible if you have been successful. AFES also offers partial funding for students who are undertaking a PhD in Petrophysics, Geology, Geophysics, Reservoir Engineering or Petroleum Engineering. The subject areas may include (but not limited to) using log/core data to discriminate facies characteristics within a field, using SCAL data, image log data, saturation height functions, reservoir quality, seismic rock properties, rock mechanics, production logging, determining petrophysical uncertainties etc. The current amount is up to £1000 per student per year. Any decision to award funding is entirely at the discretion of the AFES committee. Is the candidate known to AFES or SPWLA, and do they attend our events and/or take an active role in the Petrophysical community in Scotland? Does the thesis contain a ‘significant’ amount of Petrophysics, specifically does it advance our knowledge of Formation Evaluation? Has the applicant received funding from any other source? AFES also has money available for funding equipment, wider projects, courses or field trips that have a significant petrophysical and/or STEM (Science Technology Engineering Mathematics) component to them. This is not limited to tertiary education, we will also consider applications from secondary and primary education schools. If you have a project or an idea that requires funding, please submit a brief proposal to Ebrahim Heydari (Email). This will be reviewed by the AFES committee and funds allocated at the discretion of the committee. Funding is available throughout the year. 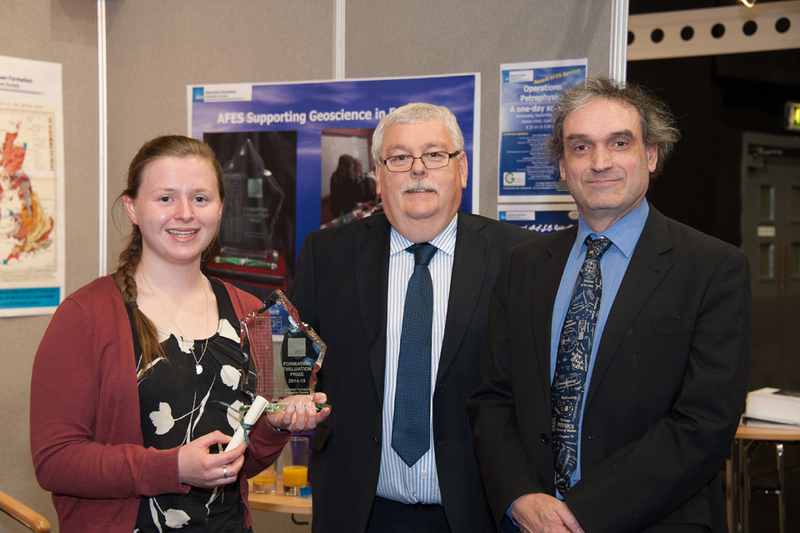 Ailsa Quirie won the 2015 AFES IPG Petrophysical Prize. AFES partially funded equipment at the University of Aberdeen, including P wave transducers to allow P and S wave velocities to be measured at stress on core plugs. This allows understanding of the anisotropy of ultrasonic velocities in core plugs, and is currently being used in five PhD projects. The society also made a donation in 2015 to the Geobus project (www.geobus.org.uk). The bus travels around Scottish Schools introducing students to Earth Science. Finally, the society also supported multiple PhD students at various Scottish Universities including The University of Edinburgh, The University of Aberdeen, Heriot-Watt University and the Robert Gordon University.